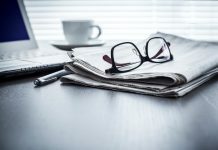 This one-page written summary provides a quick overview of the impressive influence of newspaper media in the automotive category. The easy-to-read one-page summary contains powerful information that can change where ads are placed. Vehicle advertisers need to know the facts—rather than be influenced by their gut or U.S. data that may not apply to Canada. 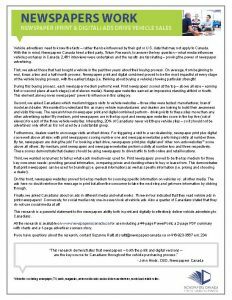 With this in mind, Newspapers Canada hired a third party, Totum Research, to answer the key question—what media influences vehicle purchases in Canada. 2,461 interviews were undertaken and the results are fascinating—proving the power of newspaper advertising. First, we asked those that had bought a vehicle in the past two years about their buying process. On average, from beginning to end, it was a two and a half month process. 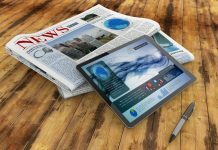 Newspapers print and digital combined proved to be the most impactful at every stage of the vehicle buying process, with the earliest stage (i.e. thinking about buying a vehicle) showing particular strength!